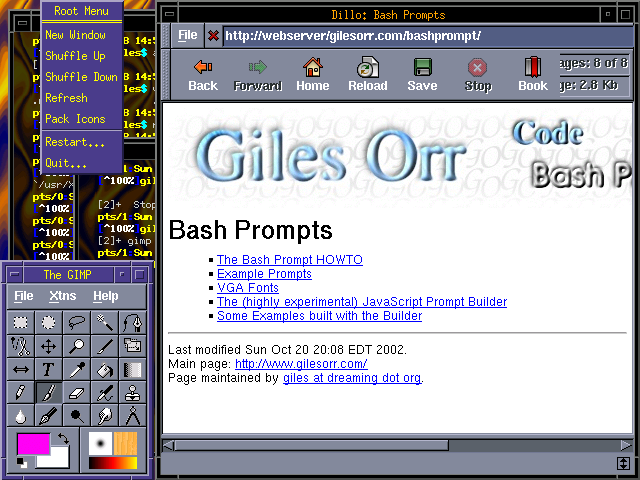 MWM screenshot, showing the menu and a modified colour scheme (default frames are gray and pale green). The Open Group's version is available at: http://www.opengroup.org/openmotif/. Lesstif (which has a fully open source license) is available at: http://www.lesstif.org/. No. You can change colours. At this point MWM is more a historical curiousity than a practical window manager for most people (this from a man who uses CTWM heavily). It was in widespread use years ago - and proprietary at the time. But it's still distributed and kept up to date in two different forms: RedHat distributes the OpenMotif package which includes MWM, and LessTif also distributes another version of MWM. There are no virtual desktops or workspaces. A right-click on the desktop produces a menu. Standard window frame buttons are, in the upper left, a window menu, and the upper right has minimize and maximize. The config files are very similar in style to TWM, with similar flexibility of control over mouse and button behaviour. A nice touch is the addition of an INCLUDE statement. Oddly, control over window and menu colours are through Xdefaults. This is perhaps "correct," but it's also unusual. Highly configurable keys and buttons. Uses about 3M in memory, very large for such an old WM. No workspaces. No themes. Can't select your own window buttons.